And we’re back. I know, I know, you all have desperately missed the reliability and punctuality that you’ve come to love and expect from Swole Ear. Well, I’ve returned from the wilderness that is Northfield, Minnesota, and am back in the Chi-ish. Hopefully, Carleton College’s Summer Writing Program has worked some kind of miracle, and this blog will turn into something worth your time. But probably not. Anyway, here’s what I think about Foxy Shazam. You know how sometimes, you can just tell that you’re going to love a record based on the first few seconds of the opening track? Well, that’s not the case here. This record opens with about 30 seconds of a couple of dogs barking. Those woofs and barks slowly synchronize, and then melt away into a powerful, arena ready, mosh-tastic stream of over-the-top happiness. I knew that I was going to love this record based on the first minute and a half. You know me; I’m a sucker for catchy hooks, enthusiastic vocals, and an overall sense of happy. 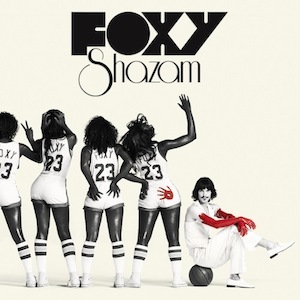 That’s exactly what I got out of Foxy Shazam’s Foxy Shazam. This record is relentless. It pounds you over the head with rainbows and sunshine (if you ignore a lot of the lyrics) for all of its 43 minutes. It’s pretty much screaming “YOU WILL LOVE ME” with a Heath Ledger Joker style grin on its face. And guess what, you will love it, unless you’re devoid of a soul. Sure, lots of the lyrics deal with breakups and the suckyness of life. On the other hand, a good portion are about happiness and bright futures. Ultimately, this record bleeds pure awesome, and if you don’t like it, I don’t like you. Glad you’re back. Swole Ear with the morning coffee has become a simple pleasure. When there is no Swole Ear, the coffee isn’t quite as delicious. Well, yes, it actually is, but, still, something is missing. I’m not sure what “mosh-tastic” means, but, on your word, I will listen to this album. I like the band name. I think more than you, I will listen to an album just because I like the band name. This is a great band name. Almost as good as Lynyrd Skynyrd. Swole Ear, I think you have to have a hard look at what you say that you like and you don’t like in music. I can recall you stating you were reluctant to listen to seventies music because of the “perfect” vocals. And this is what? Half-way through “Killin’ It”, I am thinking Meat Loaf. Based on the comments on youtube, so was the rest of the word – or else Queen. Meat Loaf and Queen defined overproduced vocals in the seventies. You dissed Springsteen for the over the top musical madness on his late seventies albums. When I got a couple of Hold Steady albums on your say-so (thanks for that, BTW) Mssrs Finn and company are clearly going for exactly that sound on some cuts. It is nice that you found a new album and group to love. These guys clearly have some musical ability, some smarts, a sense of humor and a substantial recording budget from the record company. And they leave my totally indifferent. I made it about half way through the third cut before I decided that I was wasting my time. Not for me. So, yes, music is all about the interaction between the musician and the listener. What is this blog about? Is it about your reactions to new music that you are exposed to? Discovering your own musical aesthetic? Trying to find a vocabulary that will allow you to communicate to others about music beyond their personal musical prejudices? Sorry. I just watched the clip and a few more and these guys crack me up. I’m with Swole Ear — they make you smile and that’s a good thing. I hear the Queen, but I hear Concrete Blonde on the vocals even more. Hey, different strokes for different folks. I thought that the cover was funny but nothing happening for me with the music. I tried. Your last sentence perhaps explains the whole thing: you won’t find me looking for Concrete Blond re-masters at the HMV.